I saw this challenge in the Demo Only forums on SCS - took a look at the pattern found here and here and went to work creating my backpack. Luckily for me - I had a diecut box for the bottom - I had bought them as a bulk buy from SU, and hadn't used all of them. To create the flaps, I measured how far down I wanted it to go cut my card stock, then used my coluzzle. The little box pouch that I added is 2" x 2-1/8" after assembled. 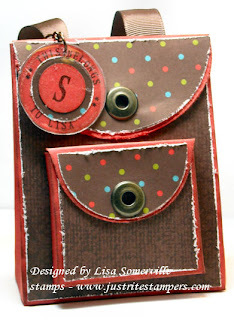 I used my JustRite Small Letter Set and monograms to create my backpack tag , punched it with the 1-1/4", 1" and 3/4" circles - encased it in some Amuse Creative Candy. It's held on to my ribbon with some hardware from Tim Holtz. I thought the Jumbo Eyelets made great flap embellishments. Wow Lisa, that is super cute! Love the patterned paper too. OMG this is so cute! I can't wait to make one for the kids' teachers! Your's is absolutely adorable! Thanks for sharing! fabtastic!! Lisa, I just told Kim that I do have an interest in buying the just right stamp...so please stop making things so I think I will need it!! Now THAT's cute, Lisa. You are the queen! This is the cutest idea I have seen in a long time. Just adorable! I am thinking of all the cute ways you could use it. Thanks so much for sharing the idea.